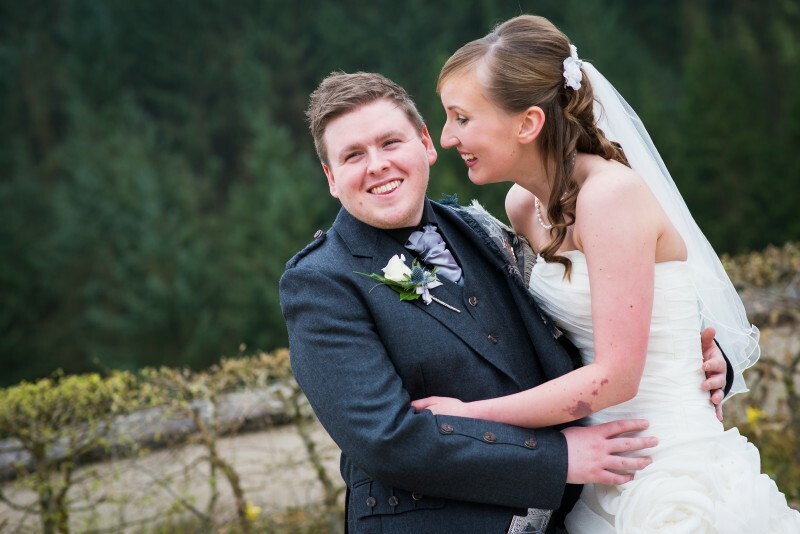 Lorna & Calum's New Lanark Wedding day flew by so quickly, no one even realised it was raining! Thankfully when we got to the rooftop terrace the drizzle stopped and we got some great photographs with it's stunning backdrop of lush green pine trees. It was a delight to photograph Lorna and Calum as they are two of the nicest people you'll ever meet, they really are and it was a pleasure to be a part of their big day. While Lorna was getting ready in her cottage, Calum and the guys were right next door doing up their cravats and splashing on some aftershave when I arrived. Lorna looked stunning as she made her way to the wedding car which was a surprise from her dad. It was only a short walk to the Music Room so Lorna wasn't expecting a car... It was a lovely touch. The Rev Jim Liddle conducted the service with his usual good humour and gusto but he also had a few tender words for Lorna and Calum after they had said their vows. After the rooftop photos the happy couple enjoyed their wedding breakfast before dancing the night away...eventually (A wee in-joke there).